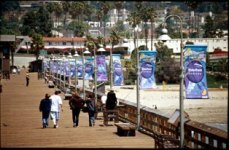 The pier was originally built in 1872, making it one of California’s oldest wooden piers. A $3.2-million renovation in 1993 has restored its original grandeur and then some. It now features interpretive display panels, a snack bar, benches, restrooms, a full-service seafood restaurant with a gift shop and spectacular views of the Channel Islands, coastline and mountains.